Two short months ago, the Wildrose party was riding high. What could possibly go wrong? Jim Prentice, that's what. Let it never be said that politics in Alberta are boring. Two short months ago, the Wildrose party was riding high. Alison Redford left the premiership in a cloud of entitlement scandals, making her one of the most loathed politicians in Alberta's history. The Hunsperger "Lake of Fire" fiasco was a distant memory. Danielle Smith had been, bit by bit, gently coaxing her party to a more socially progressive -- or at least less offensive -- middle ground. Rarely have a I seen a politician move more decisively and quickly. In a steady stream of announcements that consumed successive news cycles, Prentice systematically and surgically drained each issue the Wildrose had against the Progressive Conservatives. Smith couldn't get a word in -- or out -- edgewise. It's like he took Smith's prized sheet of bubble wrap, popped every bubble, and then handed it back to her. To make matters worse, Smith's own party had a little rebellion of its own. They rebuffed her leadership nudges to the social centre by failing (quite spectacularly), at the recent party Annual General Meeting in Red Deer, to recognize the importance of explicitly endorsing protections for gays and lesbians. Rather, they opted to broadly "recognize that all Albertans have equal rights, privileges, and responsibilities." I guess in the 21st Century, Wildrosers still can't say "gay" out loud without blushing in shame. What's worse, they don't seem to understand why these protections must be stated explicitly. 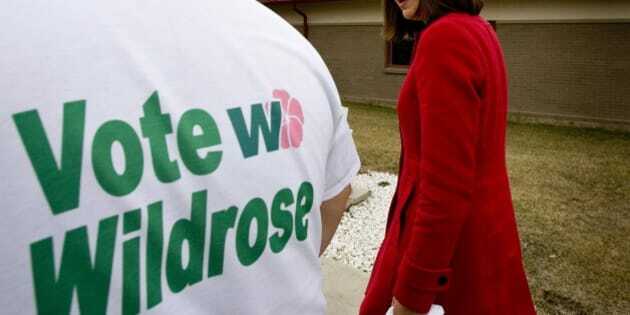 While Smith had hoped that the intolerances of the past were far behind her, the party's fundamentalist social conservatives held firm, confirming what everyone outside the party believed all along: the Wildrose dye job was a fake and its roots were showing. Smith is usually very politically astute. So I can only assume that it was a momentary lapse of judgement, likely from frustration with recently being handed her popped sheet of bubble wrap, that led her to say in her keynote address that she would step down if not elected premier in 2016. Now this would be a likely consequence anyway, but why would she publicly cast doubt on her own party's future fortunes? And then, while the Wildrose was still mid-wobble, feisty Alberta Liberal MLA Laurie Blakeman came up on the left and proposed Bill 202, a private members bill that would explicitly -- yes, explicitly -- protect gay and lesbian kids from bullying in schools. Blakeman, a longtime LGBT rights supporter, well understands that this group needs to be explicitly named because it is especially at risk of abuse, bullying, and suicide. So, after shooting itself a few times in the feet, the Wildrose then decided to empty the ammo from the chamber by proposing amendments that would effectively remove those protections from children in religious schools, where we all know homophobic bullying is enshrined in religious doctrine. I can just imagine how much safer a gay or lesbian child in that part of Alberta's school system would feel with such a Wildrose amended law in place. Well, surprisingly, yes. On Monday, two Wildrose MLAs crossed the floor to join the Progressive Conservatives. What a dazzling reversal of fortune. And it's still not even Christmas.